The Vision: To maintain and improve the health of the Brandywine-Christina watershed for the benefit of people who rely on it and plants and animals who live in the watershed. The Strategy: To implement a funding mechanism and science-based investment protocol to restore the Brandywine-Christina watershed to fishable, swimmable, and potable status by 2025. The Project: Under a grant from the William Penn Foundation, The Nature Conservancy in Delaware (TNC) and the University of Delaware (UD) are conducting a feasibility study on the implementation of a “water fund” for the Brandywine-Christina watershed. At its most basic level, a water fund is a mechanism for downstream beneficiaries to invest in upstream conservation measures designed to secure freshwater resources – both quality and quantity – for man and nature far into the future. The Target Watershed: The Brandywine-Christina is an integral part of the larger Delaware River Basin, and is 565 sq. mi. with ⅔ of the watershed in Pennsylvania. The watershed spans three states, five counties and over 60 townships, boroughs, and cities and includes the Brandywine, Red Clay, and White Clay Creeks, and the Christina River watersheds. It provides many ecological and natural functions and provides over 100 mgd of drinking water for over half a million people. The Pennsylvania portion of the watershed is characterized by open space, including agricultural land and forests, while the more urban, southerly portion in Delaware tends to have more developed land. Only a very small piece of the watershed lies in Maryland. The Brandywine-Christina Water Fund: Legacy pollutants, nutrient overloads, failing septic systems and urban runoff have rendered the great majority of the streams, rivers and lakes in this watershed unsafe for swimming and fishing, let alone drinking. In recent years, the Christina Basin Clean Water Partnership has funded projects to restore the waters of the watershed by piecing together grants. Lack of consistent and stable financing hampers progress in restoring the watershed. UD and TNC propose to develop a new business model to restore the waters of the watershed. A dependable funding stream will allow for strategic budgeting of restoration projects and financing for conservation needs in the watershed to meet the water quality goals by 2025. TNC and UD are working together to assess the feasibility of a watershed-based funding strategy in the Brandywine-Christina watershed. The study is a year-long process concluding in February 2015 and includes a literature review, technical analysis, a designated advisory panel, stakeholder input, and a final report with detailed recommendations. 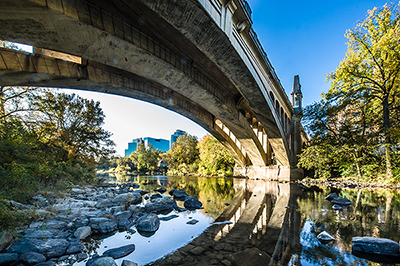 The next steps include developing a long-term financial mechanism to ensure a lasting and sustainable watershed-based investment mechanism in the Brandywine-Christina watershed.